A decade after he celebrated traditional, wood-smoked ’cue in Texas BBQ, Wyatt McSpadden captures the new urban BBQ scene epitomized by Franklin Barbecue, as well as small-town favorites such as Snow’s in Lexington. 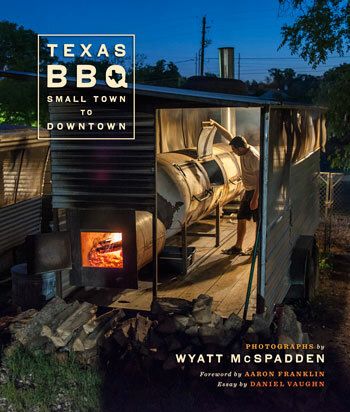 In Texas BBQ, Wyatt McSpadden immortalized the barbecue joints of rural Texas in richly authentic photographs that made the people and places in his images appear as timeless as barbecue itself. The book found a wide, appreciative audience as barbecue surged to national popularity with the success of young urban pitmasters such as Austin’s Aaron Franklin, whose Franklin Barbecue has become the most-talked-about BBQ joint on the planet. Succulent, wood-smoked “old school” barbecue is now as easy to find in Dallas as in DeSoto, in Houston as in Hallettsville. In Texas BBQ, Small Town to Downtown, Wyatt McSpadden pays homage to this new urban barbecue scene, as well as to top-rated country joints, such as Snow’s in Lexington, that were under the radar or off the map when Texas BBQ was published. Texas BBQ, Small Town to Downtown presents crave-inducing images of both the new—and the old—barbecue universe in almost every corner of the state, featuring some two dozen joints not included in the first book. In addition to Franklin and Snow’s, which have both occupied the top spot in Texas Monthly’s barbecue ratings, McSpadden portrays urban joints such as Dallas’s Pecan Lodge and Cattleack Barbecue and small-town favorites such as Whup’s Boomerang Bar-B-Que in Marlin. Accompanying his images are barbecue reflections by James Beard Award–winning pitmaster Aaron Franklin and Texas Monthly’s barbecue editor Daniel Vaughn. Their words and McSpadden’s photographs underscore how much has changed—and how much remains the same—since Texas BBQ revealed just how much good, old-fashioned ’cue there is in Texas. Widely regarded as one of the most influential pitmasters in the country, Franklin is the coauthor of Franklin Barbecue: A Meat-Smoking Manifesto and owner and chief pitmaster of Franklin Barbecue. He received the James Beard Foundation Award for Best Chef: Southwest in 2015. The barbecue editor of Texas Monthly since 2013, Vaughn is the author of The Prophets of Smoked Meat: A Journey Through Texas Barbecue.